Selecting your compost location for proper composting is important. Garden prunings, leaves, and weeds if left alone in a pile will decompose, but with composting, you want to speed this decomposition. Above all, choose a location that is easy to get to and convenient. Most of your trips to your compost will be from your kitchen (food scraps), so the location of your compost should be as close as practically possible. It should be placed as not be in the way of family and pet traffic. Caution – Do not place your compost near areas where animals are able to defecate, because feces harbor pathogens that are harmful to humans. Your location should be on a level area with good soil drainage. Soils with poor drainage will slow-down the compost decomposition. It’s not always possible, but areas with filtered shade are preferred. Also, avoid windy locations (or protect it from the wind). Windy areas can dry out and decrease the compost pile’s temperature. 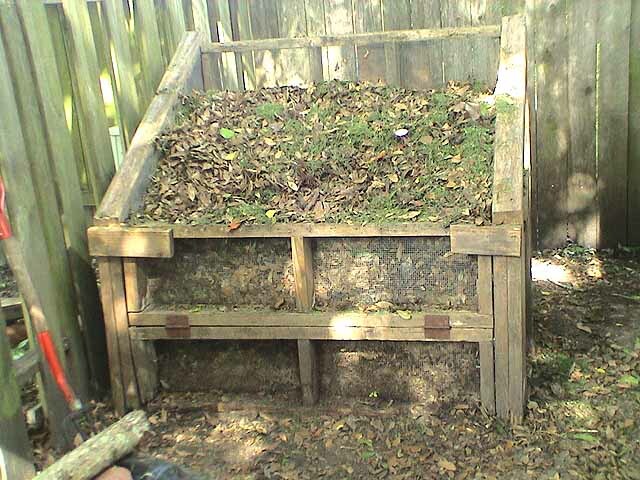 There are zillions of different ways to create a compost pile (bin or box, etc. ), but it’s a good idea to take a military approach to it and use camouflage. You can camouflage using tall flowers, manageable shrubs, a fence or a vine covered trellis. Be creative when you integrate your compost into your garden. Under trees – Locate your compost under trees with caution, because, after heavy rains and the tree’s shade, the compost may dry out too slow. The trees roots may send roots into the bottom of the compost searching for nutrients and water. Against permanent wooden structures – Compost will rot any wood in contact with it. It’s fine to use wood for the compost pile or to fence it in, as long as you know that you may need to replace it every three to four years. Under house eves or against the house – If the compost is placed under roof eves, the compost may not get enough rainfall or it may get to wet due to excessive rain run-off. Try to place your compost at least 20 feet away from the house. In sight of your neighbors – If you live in a densely populated housing area, be respectful of your neighbors. You may think that your compost is a beautiful thing, but if it’s in plain site, your neighbors may not appreciate it. Try to keep the compost out of site. Next Step - Once your compost area is in located, you can now select your compost structure.